The “Nocciolata, Sesame, and Hazelnut Rolls,” from Ottolenghi Simple, are a fulfilling and special treat. Enjoy hazelnuts with me. Put the flour, yeast, sugar, 2 Tbsp. of oil and the salt in a large bowl and mix to combine. Gently pour in the water, then, using a spatula, bring the mixture together until combined into a dough. Transfer to a lightly oiled surface and, with lightly oiled hands, knead the dough for 3 minutes, until soft and elastic. (You may need to add a little more oil if it starts to stick to the surface or your hands.) Transfer to a lightly oiled bowl, cover with a clean, damp tea towel and leave to rise in a warm place for 40 minutes, until nearly doubled in size. Combine the hazelnuts and sesame seeds in a small bowl and set aside 1 Tbsp. On a lightly floured surface, roll out the dough into a 12 x 16-inch rectangle, so that the longest side is towards you and parallel to the work surface. Using a spatula, spread the dough with the Nocciolata, leaving a ¾-inch border clear on the top edge. Sprinkle the orange zest evenly over the Nocciolata, then scatter over the sesame and hazelnut mix. With the longest side still toward you, roll the dough into a log. Brush with the remaining 1 Tbsp. of oil, then sprinkle with the remaining 1 Tbsp. of sesame seed and hazelnuts (gently press these into the dough, so they stick). Trim the ends, cut the roll into 10 segments, each 1¼ inches long, and transfer to a parchment-lined baking sheet, seam side down. Bake for about 10 minutes, until golden brown. Dust with the confectioners’ sugar and let cool slightly. Serve. My small ball of dough “nearly doubled” after more than 60 minutes. My dough rolled easily and thinned without tearing. 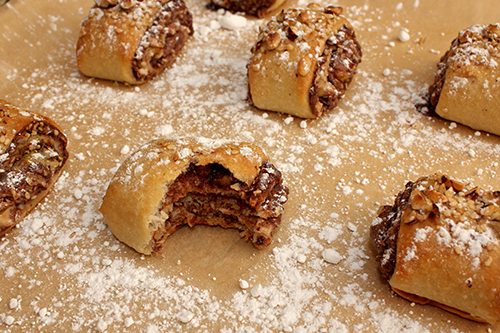 These rolls bake crisp like cookies, but the nuts and seeds give us an extra chew/complexity. You’re getting more than a cookie, here. Next week, I’ll go savory again. I want to make the “Butternut Squash with Corn Salsa, Feta, and Pumpkin Seeds,” again from Ottolenghi Simple. Come back next week, to see how simple can be fantastic. 2. Mix the butternut squash with 2 Tbsp. of oil, ½ tsp. of salt, and plenty of pepper. Spread out on a large parchment-lined baking sheet, skin down and spaced well apart. Roast for 25 minutes, until the squash is cooked through and golden brown. Remove from the oven and set aside to cool. 3. Char defrosted corn in a pan on the stove top. Place the kernels in a bowl with the chile, lime zest, lime juice, the remaining 3 Tbsp. of oil, ¼ tsp. salt, and the cilantro and mint. Mix well and set aside. 4. Arrange the squash on a separate plates or on one large platter. Spoon the salsa on top, sprinkle the pumpkin seeds, dot with the feta, and serve, drizzled with a little extra oil.